TemplateHack.com - Download NJW Simple premium blogger template. Hai guys, I will share premium blogger templates again! 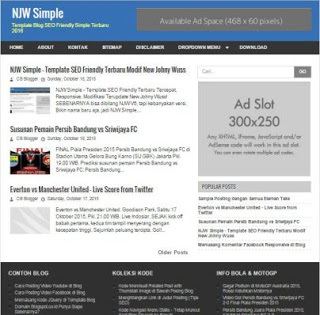 I will share NJW template, NJW is New Johny Wuss template. Before, this template names is NJW V6, but SEO NJW template almost so much, so I think this NJW Simple is more good. This is very clear blogger com templates, customizable blogger templates xml with simple design, SEO Friendly and can you use on personal blog, magazine blog, portal blog, and many more, so you must download!